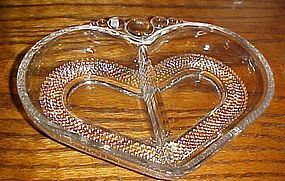 Vintage divided 2 part heart shape candy or relish dish by Duncan & Miller Glass in the clear Tear drop pattern. It measures apx 7 3/4" x 6" x 1 1/2" and is in excellent used condition with no chips or cracks. Made 1936-1955. 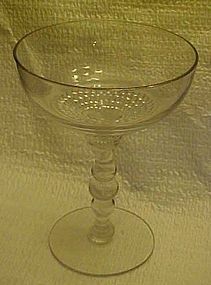 Pretty 5 1/8" tall champagne or tall sherbert made by Duncan & Miller in the teardrop pattern #301. Stacked ball stem #5301 that is similar to candlewick. Pristine condition. 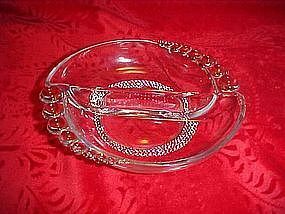 Very elegant little crystal divided dish by Duncan and Miller. Teardrop pattern was produced from 1936 -1955. Diameter is 6" and is 1 3/8" deep. Perfect condition with no chips, cracks or scratches. I have 2 available.